If I was to tell you I had this for breakfast would anyone thing I was weird? I have crazy cravings at breakfast time, when everyone else it eating cereal or toast I enjoy a good bowl of soup, chilli, lasagne or the like; I basically crave something really savoury. My usual breakfast before work is leftover dinner from the night before of cheese on toast; the thought of a great savoury meal is the only thing that gets me up in the morning. While the weekdays involve something quick (I value the extra minutes in bed), the weekend give me a bit more time to cook up a breakfast storm. This was my first breakfast back from Ibiza, as I just craved something filling, tasty and fun to make. But breakfast aside, this would also make a great lunch, dinner with some chunky chips, or even enjoyed as a lunchbox snack cold. – Grated cheese – to top. Add the pepper and the onion and fry for a further 5 minutes, until the vegetables have softened and then add the courgette and fry for 2-3 minutes until most of the juices have evaporated. In the meantime, whisk together the eggs, oregano, mustard powder, milk, paprika and salt and pepper and then pour into the pan with the vegetables. Leave to bubble away on a medium heat until you can see that the egg around the sides of the pan has started to cook. Slice up and serve with a lovely summery salad. 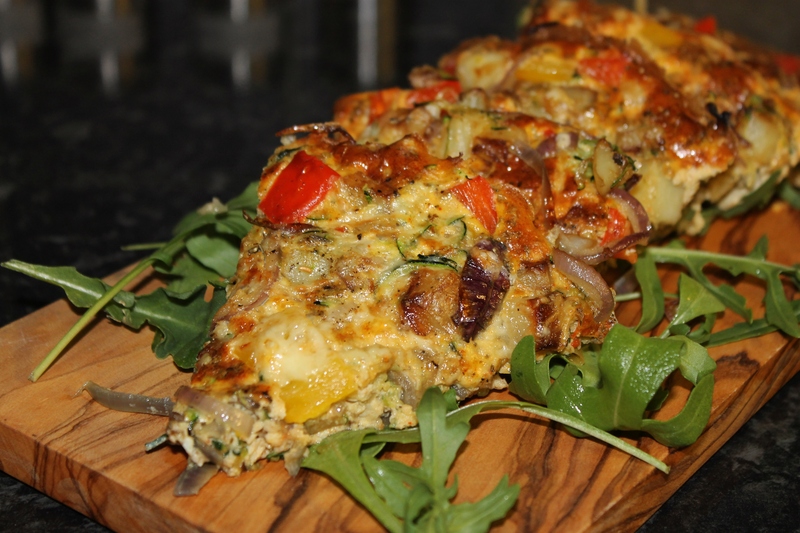 Pingback: Mediterranean Vegetable and Potato Omelette | Catching up with Homemade With Mess | Hey Sweetheart, Get Me Rewrite! Mmmm, I want some right now! I forgot to say your omelette looks amazing! Ha ha, I understand. As soon as I get talking about breakfast I totally forget what I was going to talk about in the first place! Yes – savoury breakfast every time! I love it :)… Looks delicious and am sure tasted great too. Looks like a great breakfast to me. Weekend brunch too…getting hungry here. Sometimes the best things aren’t new inventions but variations on tried and true. Love how you have sliced up the omelette. Genius! We Absolutely LOVE omelettes and yours looks fantastic, you can see how good it tastes! Looks fabulous! I just did pro-savoury-breakfast post myself – which was actually a post about being nice to my sweet-toothed hubby and making the occasional batch of pancakes! Savoury breakfast RULES. Love your posh wooden board + rocket leaves presentation too! It’s like a beautiful frittata!